What's The Most Derivative Car Ever Made? Car design is pretty conservative and derivative. Sometimes, however, car styling crosses the line from 'referential' into 'total ripofff' territory. It's no surprise that new cars often look like some older models, or that cheaper cars often emulate more expensive exotics. Why? Well, there's only so much design room to play with. All cars have their headlights, wheels, taillights and grills in pretty much the same places. Beyond that, car buyers are fairly conservative. Breaking totally new ground is seriously risky business and just about nobody tries it. And sometimes new car makers think they can cash in on more prestigious looks from other makers. 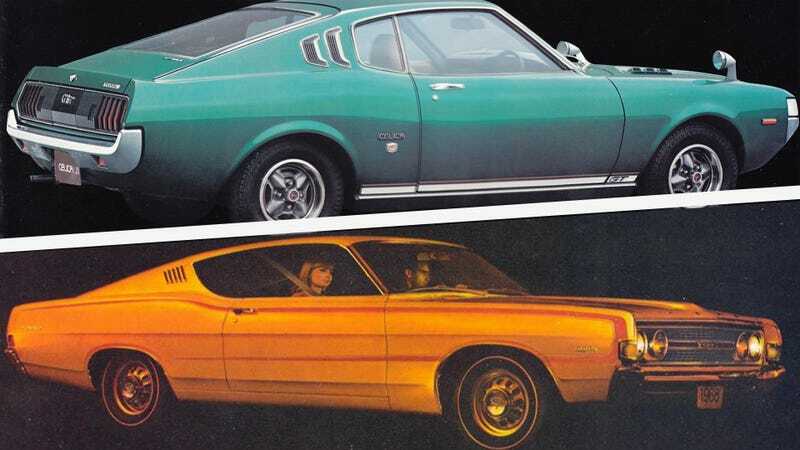 Just take a look at an original Toyota Celica fastback and compare it to a bigger, earlier Ford Fairlane 500. It's like Toyota just shrunk the Ford in the wash. Similarly, Kake Bake pointed out some similarities in the totally-gonna-happen V16 HAL from Australia. I see a Mazda Furai, SSC Tuatara, LaFerrari, and a catfish. On the contrary, if it's been influenced by so many cars then it's very inspired! By those cars. Either way, the HAL looks kind of handsome, and I am a huge fan of the first-gen Celica. I'm not going to say that derivative car designs are bad, but I am going to ask what is the most derivative car design you've ever seen? Post the original design, and then post the ripoff with it. I know there's a particular pair of Volvos I can think off of the top of my head. What can you come up with?